Samsung (News - Alert) Electronics Co., Ltd., a world leader in advanced semiconductor technology, today announced that its 5-nanometer (nm) FinFET process technology is complete in its development and is now ready for customers' samples. By adding another cutting-edge node to its extreme ultraviolet (EUV)-based process offerings, Samsung is proving once again its leadership in the advanced foundry market. Compared to 7nm, Samsung's 5nm FinFET process technology provides up to a 25 percent increase in logic area efficiency with 20 percent lower power consumption or 10 percent higher performance as a result of process improvement to enable us to have more innovative standard cell architecture. Another key benefit of 5nm is that we can reuse all the 7nm intllectual property (IP) to 5nm. Thereby 7nm customers' transitioning to 5nm will greatly benefit from reduced migration costs, pre-verified design ecosystem, and consequently shorten their 5nm product development. "In successful completion of our 5nm development, we've proven our capabilities in EUV-based nodes," said Charlie Bae, Executive Vice President of Foundry Business at Samsung Electronics. "In response to customers' surging demand for advanced process technologies to differentiate their next-generation products, we continue our commitment to accelerating the volume production of EUV-based technologies." 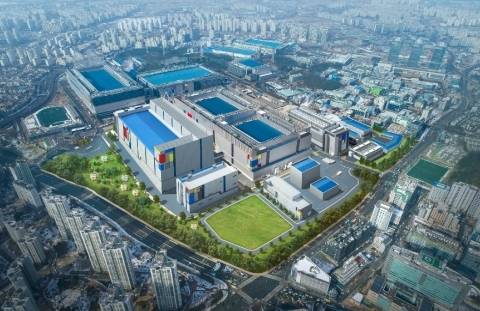 In October 2018, Samsung announced the readiness and its initial production of 7nm process, its first process node with EUV lithography technology. The company has provided commercial samples of the industry's first EUV-based new products and has started mass production of 7nm process early this year.